We recently endured a stretch of freezing nighttime temperatures. This usually means two things: Hell's weather hotline is being swamped with calls, and it must be time for another Eagles reunion. In our desert climate, freeze warnings are a cause for great alarm. We don’t often have to deal with water in its frozen state. Come to think of it, we don’t often have to deal with water in its liquid state either. Ditto for water vapor. Consequently, we run our water pipes willy-nilly all over the place because we don’t have to think about protecting them from the cold. We leave our animals outdoors year-round, because there's not much chance of them turning into petsicles overnight. And we buy our plants based on their pretty shapes and colors, not on whether they can tolerate a freezing night or two. Nothing seems to mobilize the valley quite like the threat of cold weather. In their finest moments, the Suns used to be able to muster up a similar sense of civic industriousness, but those days are long gone. But anytime the forecast calls for 32 degrees or less, people you normally never see are outside with their ladders and their bed sheets, frantically working to cover up their citrus trees and bundle up their bougainvilleas. 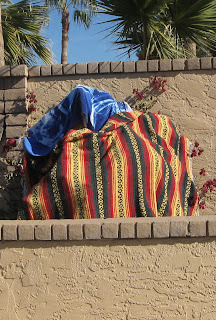 Anyway, this being one of the more dramatic examples of cold we’ve endured in the last thirty years, I thought it would be a good time for a visual survey of how different people approach the problem of protecting their plants. I took the following pictures almost entirely from one small neighborhood in the area where my oldest daughter goes to school. As you will see, there is a wide range of techniques, philosophies, and strategies evidenced in the following photos. Covering up, with plants as with fashion, seems to mean different things to different people. This is a reasonably average Arizona response to a freeze warning. You pull out the pool towels (which you're not using at the moment anyway), maybe grab a few blankets, and head out front. If it's a plant you really don't want to lose, you drape a towel over it and hope for the best. 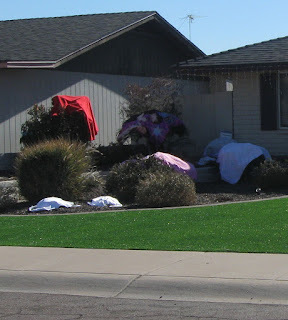 It's not foolproof, but it does strike a balance between having to re-landscape your yard in the spring, and sitting out all night with the blow dryer. This, in contrast, is what happens when things get out of hand. I raised two daughters, and I don't think I ever put a diaper on either of them that fit as snugly as the blanket on this tree. 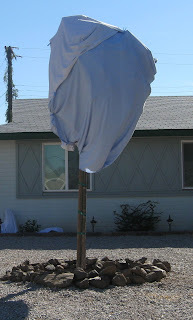 Note the use of clothespins clipping the blankets perfectly in place. Not only does this tree not have to worry about freezing, it doesn't have to worry about being sat in by birds, or infected by any known airborne tree viruses. In fact, the only problem I can see is if a giant happens by, and takes it for a big Tootsie Pop. Here is the polar opposite of the last one. 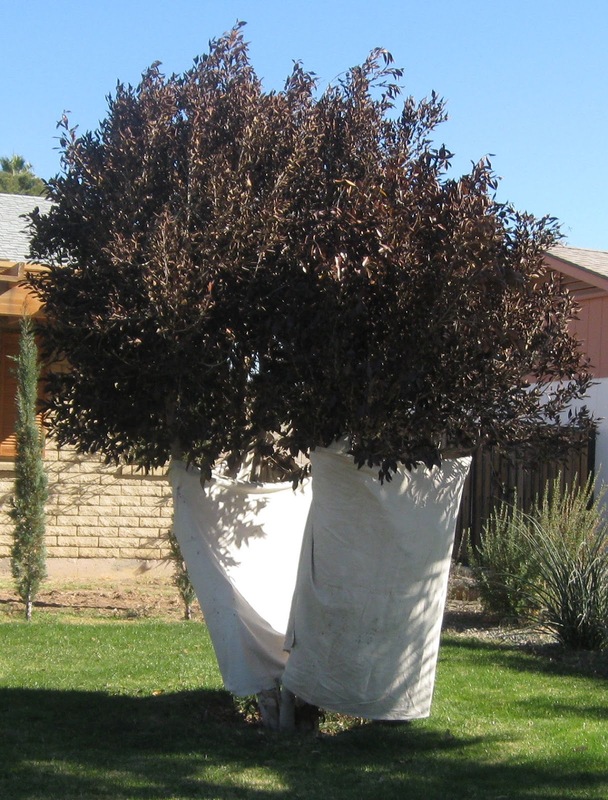 The strategy in this case is simply to confuse the cold by randomly covering only sections of the tree. The idea is that the cold will come, see this tree and be disoriented, if not by the asymmetrical coverage pattern, then by the dizzying vertical stripes on the foremost sheet. 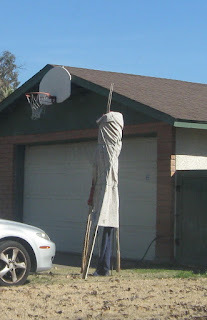 This homeowner has wisely discovered that cold operates like a car thief; if you make it at all difficult, it'll just move on to an easier target. Speaking of cars, these folks just said, "Screw the plants; what about our frost-sensitive vehicles?!" In their defense, though, it's easy to forget what needs protecting when you only deal with this situation once every few years. 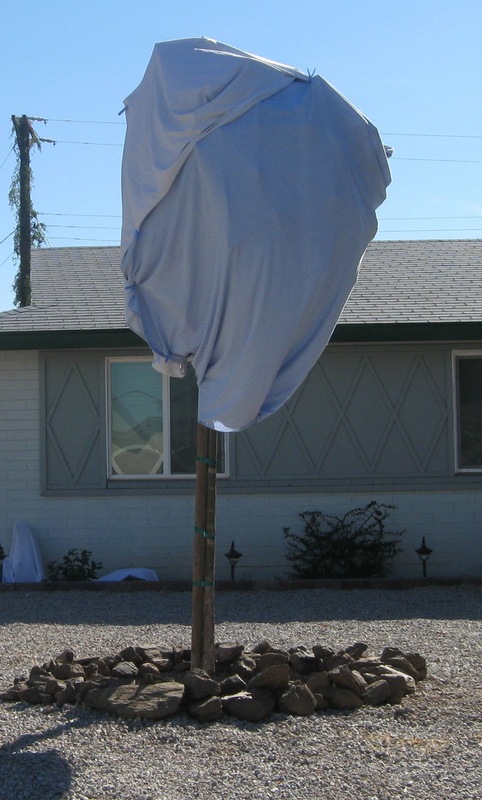 These people took the counter-intuitive approach of covering the bottoms of their trees. Time will tell if it proves effective. It does make a certain amount of sense, though; it's a well-documented fact that trees lose most of their body heat through their trunks. Or maybe these were just people with really short ladders. Nothing says Arizona like the beach towel and serape combination. Hmmm. Am I crazy, or does it almost look like there might be a family of illegals hiding under that blanket? Damn you, SB1070! People shouldn't have to live that way. 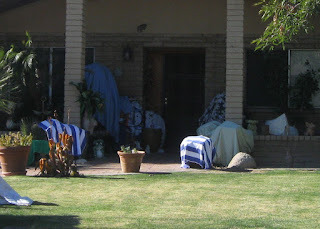 It used to be popular around here to cover plants with plastic to protect them from the cold. That idea has fallen out of fashion in recent years, however. Experts say it's hard on the plants. Really? As hard as freezing your vesicles off? Anyway, I'm kind of hoping plastic makes a comeback; it's just so much classier than cloth, don't you think? This is a great example of the ever-popular "shotgun strategy." You take your blankets, throw them up in the air as high as you can, and let God determine what gets saved. It's like Presbyterianism for plants. This is a close variation of the previously mentioned 'confuse the cold' strategy. This one works by taking the scariest-looking sheets you can find and hanging them haphazardly about the yard. 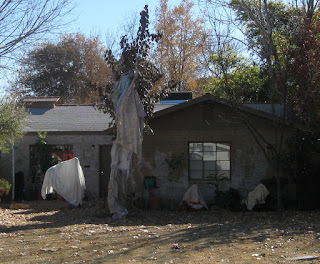 It doesn't do much to warm the plants, but seriously, if it were dark out and you were the cold, would you go in there? Does anyone else think these plants look like they're about to be executed? I'm sorry, but I look at this picture and all I can see are five frightened plants, standing stiffly, waiting for the firing squad to pull the trigger. I don't even know how a plant can begin to look frightened in the first place, but these definitely do. Except that one in the blue; that one looks like he couldn't care less. 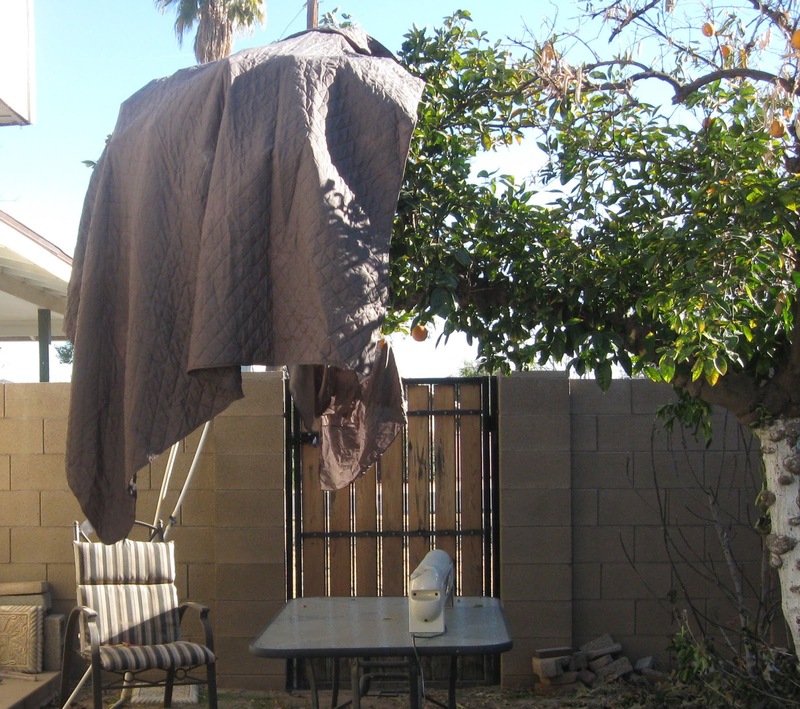 And finally, here's a picture of my own feeble efforts to protect our navel orange tree. Quick test: can you tell which philosophical approach I subscribe to in protecting plants? Maybe a bit of 'confuse the cold' mixed with some 'shotgun strategy'? Actually, under normal circumstances, I'm a pure Darwinist when it comes to our plants. If it can't survive whatever Mother Nature wants to throw at it, well, then it's 'out you go, and don't let the shovel hit you on the way out.' I'm not losing any sleep over it. This is a special situation. This is our only navel orange tree, and it's already dying a slow death. Even as it withers away, though, it still produces some of the sweetest, tastiest oranges on God's green earth. 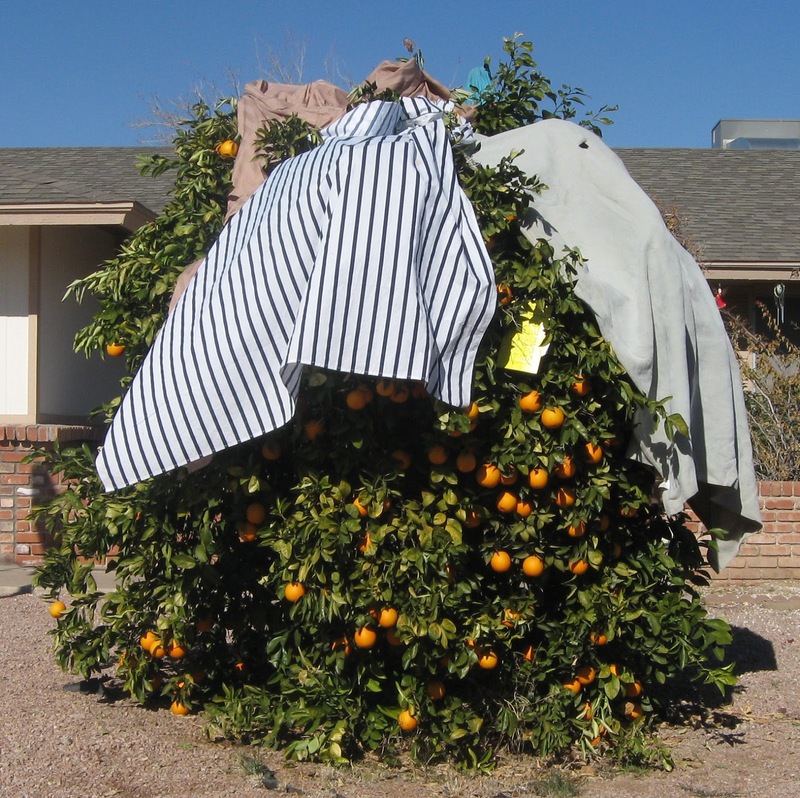 So I covered the only orange-producing branch in the hopes of getting at least one more year of oranges before it keels over completely. Notice the space heater on the table under the tree. I ran it for four nights straight. It probably violated our homeowner's policy, but it's a risk I had to take. Seriously, the oranges are that good. Ha ha. We have indeed seen all these strategies employed. Such funny observations. We are strict darwinians here. I think survival of the fittest works just fine for plants. Wouldn't want to be held personally to that standard, though. Thanks for checking in. Oh my gosh I laughed my booty off! So glad I could do that for you, anonymous. I'll let you know if I see it. Thanks for reading!